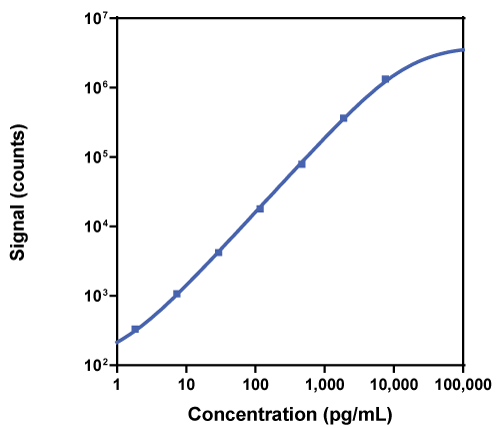 The R-PLEX Human GIP (total) Antibody Set includes a matched capture and detection antibody pair and calibrator for the quick and easy measurement of GIP (total) in biological samples. R-PLEX products leverage MSD’s electrochemiluminescence technology for better sensitivity and a larger dynamic range than traditional ELISAs. R-PLEX matched antibody sets enable the development of singleplex and multiplex immunoassays. Individual assays may be developed using MSD avidin- or streptavidin-coated plates. Custom multiplex assays with any combination of R-PLEX analytes, as well as R-PLEX plus U-PLEX analytes, can be developed on U-PLEX MULTI-SPOT plates. To learn more about the advantages of R-PLEX products click here. Description - Gastric Inhibitory Polypeptide (GIP, Glucose-dependent Insulinotropic Polypeptide, incretin) is synthesized by enteroendocrine K cells and is secreted into plasma in response to nutrient flow. GIP binds to G-protein coupled receptors in many tissues. GIP protects the small intestine from acid damage and induces insulin secretion. It has been reported that Type 2 diabetics are resistant to GIP. The GIP (total) assay recognizes both the active (1-42) and inactive (3-42) forms of GIP. Impact of intestinal electrical stimulation on nutrient-induced GLP-1 secretion in vivo. Roux-en-Y gastric bypass surgery but not vertical sleeve gastrectomy decreases bone mass in male rats.